The season of giving is upon us folks, so strap in for a lesson in gifting! Let me guess… your friend, spouse, super attendant, local librarian, etc… is a big old Doctor Who fan and you don’t know a Dalek from a donut. Don’t fret, I was just like you once! Thankfully I’ve spent the last eight years of my life getting familiar with our product so you don’t have to pay attention to your loved one’s interests. I mean, who has the time to really care now-a-days anyway? And why would you even bother when you know you can step through those big wooden doors and ask one of our many knowledgeable staff members to get you the gifty goods that make you look like you have been reading Saint Nick’s personal e-mails. I wonder if Santa’s e-mail is filled with spam about antler enlargement and beard dye? Anyway… use the following Whovian wish list as a gift giving guide and I’m sure your loved ones will think you actually do love them. Only a gift giver that really pays attention to the needs of the recipient could come up with a present that perfect. Socks – We’ve all dreaded getting socks for Christmas, well not this year! With every length and design combination imaginable we got more DW socks than you can shake a foot at. Doctor Who Time Vortex Watch – Even a time traveler needs to know what time it is. The TARDIS flies around the vortex each minute on this bad boy! Tardis One Piece Pajamas – Time to retire those old sleeping garments and get into this adult sized Tardis costume one piece pajama with the footsies and all… and yes they have those grippy little nubs on the bottom of the feet. Dalek 16 oz Tumbler Set – Exterminate your thirst with this Dalek Tumbler set. 5 different colored cups with lids and straws that make these guys look just like one of the Doctors foes. 11Th Doctor Mr.Potato Head – Here is a gift that is sure to get someone ex-FRY-ted! The worlds of Sci-Fi and Starches collide right now with this Mash Smith 11th Doctor Mr. Potato Head. Comes with all the fixens! Doctor Whooves My Little Pony Back Pack – So your giftee loves both Doctor Who and My little Pony, and also goes to a school where they only use really small books… well we’ve got the perfect thing for them! Whovian, Brony, whateves. Tardis Tea Pot – Brew yourself a spot of English Breakfast Tea and serve it up to your guests in this Tardis shaped tea pot during your next Doctor Who get together. Doctor 3-D Figural Mug – Ever wonder what it would be like to eat French Onion Soup out of your favorite Doctors skull? Well now you can! Pick from an array of awesome 3-D Figural mugs! And that my friends is just the tip of the proverbial iceberg. I could go on and on with Doctor Who gift ideas, in fact I might just do another DW gift idea list before the X marks the Mas. But before I do this topic again I hope to get a few more lists up specific to other factions of fandom. With a little bit of help by the end of this gift giving season everyone will be begging to be on your x-mas shopping list! It’s not too late for all you boys and ghouls to plan a wicked weekend at Chiller Theater Expo! Meet Zacherley, Alice Cooper, Butch Patrick, Linda Blair, and tons of other awesome guests! 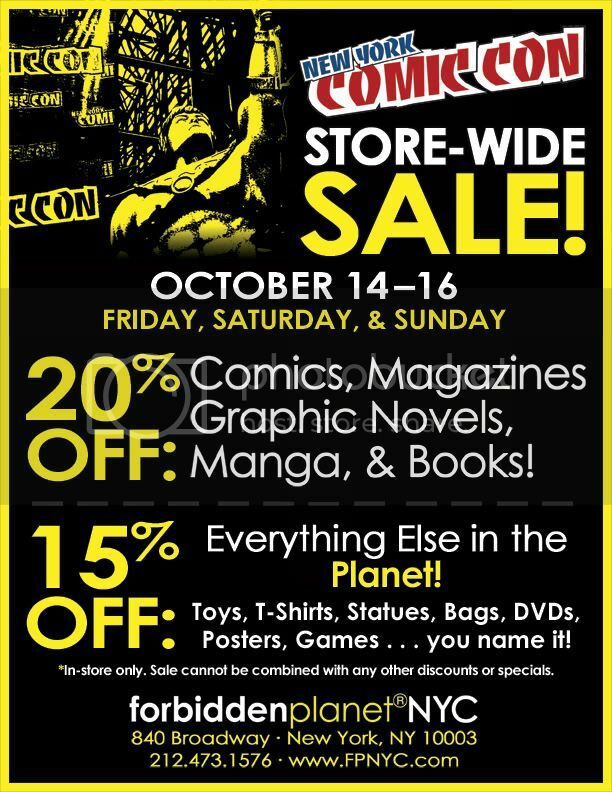 Starting today buy your tickets for Mike Carbo’s New York Comic Book Marketplace at Forbidden Planet! It’s a one-day Marvel tribute show with tons of artists, creators, dealers and stars appearing! Not to mention a chance to meet the one, the only… Stan Lee. See you there Merry Marketplace patrons!